What is marrow? This question spontaneously pops up as I hold the 2017 publication of the Ecca Poets – their 20th book in 25 years. 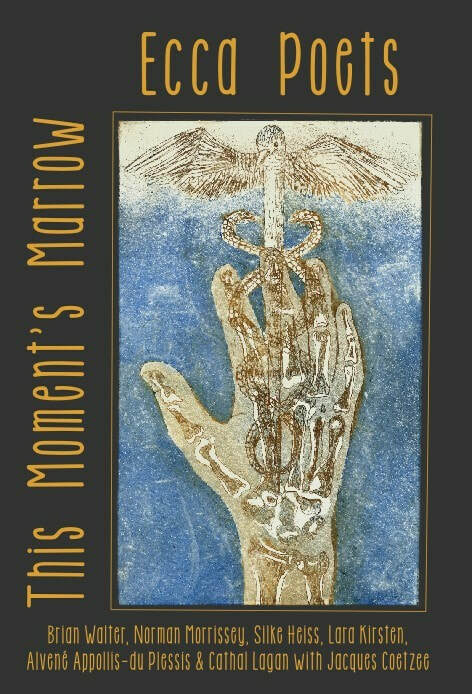 This edition, This Moment’s Marrow, offers the reader an eclectic group of poets in an anthology which makes for an enriching read. So what is marrow? Dictionaries present definitions we know so well that we probably seldom pause to think about the profound meaning of the word. Marrow is “a soft fatty substance in the cavities of bones” the internet offers, and also “ the essential part of something”. Synonyms given are: “essence, core, pith” and “heart”. In the reading of This Moment’s Marrow, I discover and experience the whole spectrum of these dictionary entries. The anthology title is taken from a Norman Morrissey poem on page 26. All of the Morrissey poems in this anthology show an accomplished poet at his task. Strong pastoral imagery, bursting with life, alternates with delicate vignettes of tenderness and tranquil silence. If the function of marrow is to generate blood cells, the vital role of Ecca get-togethers is evident. Nurturing and giving oxygen, the group promotes growth in individual poets. All have successfully made their own paths as well – since paths are made by walking, as the Spanish poet Antonio Machado so succinctly put it. Children and babies feed the marrow of a mother’s soul, as they do that of the poet. they whirr and cough and patter and sigh. pull away gently, sensing why. but am lost in the dark by the Wood owl’s cry. ​Review of seven books of love poems: Tryst, Learn the Dance, Simply in Love; To the Far Horizon; Love Letters to the Earth; A Shell Held to the Ear and the final book, The Only Altar, published after Norman’s untimely death. To say I was moved is an understatement. I attended Silke’s readings of the last book, The Only Altar with some trepidation after receiving the books to review and an invitation to a reading in Simon’s Town earlier this year. How was I going to cope, listening to poems from a beautiful woman poet whose beloved soul mate and husband has died? Silke held herself perfectly, read with passion, simplicity and love. It was I who received the jolt. These poems could have been about my life, my soulmate, right down to the ill health, watching your loved one struggling and in pain, joy in the mundane, gratefulness. After reading the first five books again I can finally put pen to paper, not because I dislike them, quite the opposite; the poetry reaches my inner core and I’ve had to reach right in and acknowledge so much that is similar. The poetry in these books are of two adults, broken, hurt individuals who discover raw, all-empowering love with a soul mate. who could have been a long-lost lover in a former life. They are besotted, like young lovers exploring their bodies and powerful sexual urges. The beauty of mature love is that these lovers find perfection in each other where others would see age, wrinkles and gnarled hands. The poets and lovers find beauty in each other and all around them amidst the feelings of angst at Norman’s failing health. Each is absorbed by the other, to the end Norman sees Silke’s beautiful frail body (that has grown smaller as his health dwindles) as delicate and bud-like. Time is of the essence, Silke and Norman make the most of each day, sitting and writing to each other or sms’ing when they are not together. The love tryst carries on far beyond the reach of a mortal body. The soul is ever present, talking in the wind, the sky, the earth, the butterfly landing on a rose.